Perched on a lonesome bluff above the dusty San Pedro River, about 30 miles east of Tucson, the ancient stone ruin archaeologists call the Davis Ranch Site doesn’t seem to fit in. Staring back from the opposite bank, the tumbled walls of Reeve Ruin are just as surprising. Some 700 years ago, as part of a vast migration, a people called the Anasazi, driven by God knows what, wandered from the north to form settlements like these, stamping the land with their own unique style. “Salado polychrome,” says a visiting archaeologist turning over a shard of broken pottery. Reddish on the outside and patterned black and white on the inside, it stands out from the plainer ware made by the Hohokam, whose territory the wanderers had come to occupy. These Anasazi newcomers — archaeologists have traced them to the mesas and canyons around Kayenta, Ariz., not far from the Hopi reservation — were distinctive in other ways. They liked to build with stone (the Hohokam used sticks and mud), and their kivas, like those they left in their homeland, are unmistakable: rectangular instead of round, with a stone bench along the inside perimeter, a central hearth and a sipapu, or spirit hole, symbolizing the passage through which the first people emerged from mother earth. “You could move this up to Hopi and not tell the difference,” said John A. Ware, the archaeologist leading the field trip, as he examined a Davis Ranch kiva. Finding it down here is a little like stumbling across a pagoda on the African veldt. For five days in late February, Dr. Ware, the director of the Amerind Foundation, an archaeological research center in Dragoon, Ariz., was host to 15 colleagues as they confronted the most vexing and persistent question in Southwestern archaeology: Why, in the late 13th century, did thousands of Anasazi abandon Kayenta, Mesa Verde and the other magnificent settlements of the Colorado Plateau and move south into Arizona and New Mexico? Scientists once thought the answer lay in impersonal factors like the onset of a great drought or a little ice age. But as evidence accumulates, those explanations have come to seem too pat — and slavishly deterministic. Like people today, the Anasazi (or Ancient Puebloans, as they are increasingly called) were presumably complex beings with the ability to make decisions, good and bad, about how to react to a changing environment. They were not pawns but players in the game. Looking beyond climate change, some archaeologists are studying the effects of warfare and the increasing complexity of Anasazi society. They are looking deeper into ancient artifacts and finding hints of an ideological struggle, clues to what was going through the Anasazi mind. “The late 1200s was a time of substantial social, political and religious ferment and experimentation,” said William D. Lipe, an archaeologist at Washington State University. When scientists examine the varying width of tree rings, they indeed see a pernicious dry spell gripping the Southwest during the last quarter of the 13th century, around the height of the abandonment. But there had been severe droughts before. Hopi was far from an anomaly. “The whole abandonment of the Four Corners, at least in Arizona, is people moving to where it’s even worse,” said Jeffrey Dean, an archaeologist at the University of Arizona’s Laboratory of Tree-Ring Research. Some archaeologists have proposed that colder weather contributed to the downfall. Measurements of the thickness of pollen layers, accumulating over decades on the bottom of lakes and bogs, suggest that growing seasons were becoming shorter. But even when paired with drought, the combination may have been less than a decisive blow. Though the rains returned, the people never did. 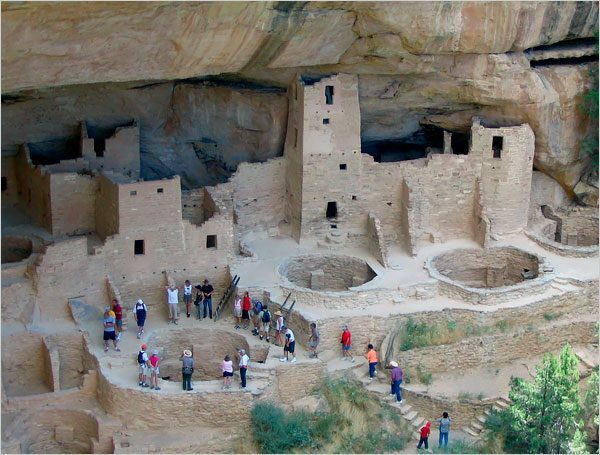 In the remains of Sand Canyon Pueblo, in the Mesa Verde region, Kristin A. Kuckelman of the Crow Canyon Archaeological Center in Cortez, Colo., sees the story of a tragic rise and fall. As crops withered, the inhabitants reverted from farming maize and domesticating turkeys to hunting and gathering. Defensive fortifications were erected to resist raiders. The effort was futile. Villagers were scalped, dismembered, perhaps even eaten. Families were slain inside their dwellings, and the pueblo was burned and abandoned. Curiously, as was true throughout the region, the victors didn’t stay to occupy the conquered lands. But violence was not always an obvious factor. Throwing a wrench into the theories were those curious wanderers from Kayenta. They thrived in their pueblos until about 1290 — some 15 years after the Great Drought began. And when they finally departed for the San Pedro Valley and other destinations, the evacuation was orderly. At Kiet Siel, a cliff dwelling now part of Navajo National Monument in northeast Arizona, people sealed the openings of granaries with carefully fitted rock slabs, caulking the edges with a collar of clay. Finally the evacuees blocked the entranceway to the settlement with a large wooden beam. “It’s pretty clear that these people weren’t freaking out or weren’t in a hurry when they left,” Dr. Dean said. Ultimately the motivation for the abandonments may lie beyond fossils and artifacts, in the realm of ideology. Imagine trying to explain the 19th-century Mormon migration to Utah with only tree rings and pollen counts. By studying changes in ceremonial architecture and pottery styles, Donna Glowacki, an archaeologist at the University of Notre Dame, is charting the rise of what may have been a new puebloan religion. For more than a century, the established faith was distinguished by multistory “great houses,” with small interior kivas, and by much larger “great kivas” — round, mostly subterranean and covered with a sturdy roof. Originating at Chaco Canyon in northwest New Mexico, the formidable temples seem designed to limit access to all but a priestly few. Though Chaco declined as a regional religious center during the early 1100s, the same architecture spread to the Mesa Verde area. But by the mid 1200s, a different style was also taking hold, with plazas and kivas that were uncovered like amphitheaters — hints, perhaps, of a new openness. At some sites, serving bowls became larger and were frequently decorated with designs, as though intended for a ritual communion. If the pueblo people had left a written history perhaps we would read of the Anasazi equivalent of the Protestant reformation. But the analogy can’t be pushed too far. The new architecture also included multiwalled edifices — some round, some D-shaped — that might have been chambers for secret rituals. Though the dogma may be irrecoverable, Dr. Glowacki argues that it rapidly attracted adherents. A center of the movement, she said, was the McElmo Canyon area, west of Mesa Verde. Excavations indicate that the population burgeoned along with the new architecture. An influx of different pottery designs suggests immigrants from the west were moving in. Then around 1260, long before the drought, the residents began leaving the pueblo, perhaps spreading the new ideology. Other archaeologists see evidence of an evangelical-like religion — the forerunner, perhaps, of the masked Kachina rituals, which still survive on the Hopi and Zuni reservations — appearing in the south and attracting the rebellious northerners. Salado polychrome pottery may have been emblematic of another, possibly overlapping cult. In an effort to draw together the skein of causes and effects, Dr. Kohler and members of the Village Ecodynamics Project are collaborating with archaeologists at Crow Canyon on a computer simulation of population changes in southwest Colorado from 600 to around 1300. Juxtaposing data on rainfall, temperature, soil productivity, human metabolic needs and diet, gleaned from an analysis of trash heaps and human waste, the model suggests a sobering conclusion: As Anasazi society became more complex, it also became more fragile. Corn was domesticated and then wild turkeys, an important protein source. With more to eat, the populations grew and aggregated into villages. Religious and political institutions sprung up. When crops began dying and violence increased, the inhabitants clustered even closer. By the time the drought of 1275 hit, the Anasazi had become far more dependent on agriculture than during earlier droughts. And they had become more dependent on each other. “You can’t easily peel off a lineage here and a lineage there and have them go their own way,” Dr. Kohler said. “These parts are no longer redundant. They’re part of an integrated whole.” Pull one thread and the whole culture unwinds. Amid the swirl of competing explanations, one thing is clear: The pueblo people didn’t just dry up and blow away like so much parched corn. They restructured their societies, tried to adapt and when all else failed they moved on.